Want to ESCAPE to an oasis of relaxation that exceeds expectations, stimulates creativity, and provides unbelievable moments in time? Now who wouldn't say YES! Spa Paradiso offers a resprite from the world to relax, revive and rejuvenate. Whether it be for a full spa treatment or a simple smashing new hair cut, this is the place. Tucked in the basement of the historic Davenport Hotel, the spa and salon have the same elegant look as their upstairs host. 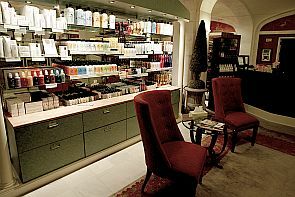 The upscale hair salon, hand, nail and foot care area are complemented by large white archways, designer wallpaper and spacious mirrored walls. Divine! Delightful back rooms offer even more escape to treatments focusing on the whole body with remineralization, detoxification, rejuvenation, and rehydration–each performed by a licensed professional trained in the latest spa therapies. Escape to paradise!